On April 8th, bauma 2019, the biggest engineering & mining machinery exhibition over the world, was opened in Munich, Germany. It’ll last for 7 days. More than 3700 exhibitors from over 60 countries and regions are attending this great exhibition. As a world-class brand, with no doubt, ZENITH attends the exhibition, bringing a full range of crushing and screening products. Besides, ZENITH was invited to attend the introduction and marketing event of Chinese engineering machinery brands, on which the appearance of our two hydraulic cone crushers immediately appealed much attention. They reveal ZENITH’s great enthusiasm on detail treatment and product quality to the world. 2 days on, ZENITH’s booth welcomed many visitors from different countries and regions across the world. 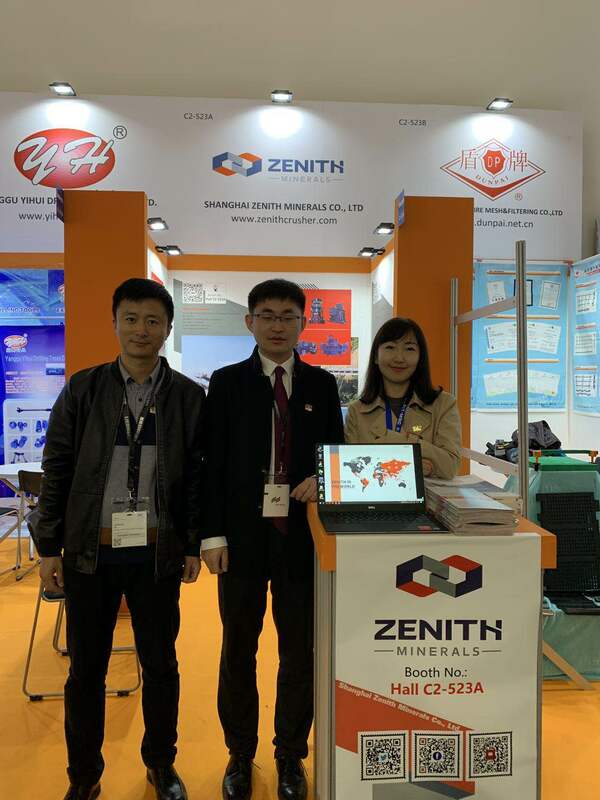 Through talks and consultations, they not only had a deeper understanding of ZENITH’s profession in aggregate field, but also truly realized how powerful Chinese manufacturing strength is. On the exhibition, ZENITH also introduced some successful customer cases to visitors. Every elaborately-designed project, every customized production line…. all symbolizes that ZENITH is customer-oriented. ZENITH never lets up the pursuit of quality product and sincere service. As a professional manufacturer and supplier in aggregate industry, ZENITH, after over 20 years’ technological accumulation, has become a widely recognized brand in this industry. ZENITH has enough confidence to be listed as a top brand by virtue of impeccable technologies and product quality. For years, ZENITH, laying root in China, has been actively marching towards foreign markets. Observing the principle --- service for the world, ZENITH has successfully exported products to more than 130 countries and regions. As the B&R initiative is further promoted, ZENITH’s products are expected to win more favors from foreign markets. Under the globalization strategy, ZENITH is eager to demonstrate Chinese manufacturing strength to the whole world. ZENITH is a Shanghai-based company, focusing on the R&D of various crushers, grinding mills and other auxiliary facilities such as screens, conveyors and feeders. In building aggregate industry, ZENITH can offer all kinds of jaw crushers, impact crushers, cone crushers and sand-making machines. By free combination, they can form over 100 types of production layouts, fully satisfying customers’ demands for different materials and capacity. In industrial grinding field, ZENITH is also known for its excellent mills, including MTW series and MTM series, LM series, LUM series and ball mills. For coarse powder, fine powder or superfine powder production (0-2500mesh), there is always a suitable grinding mill for you. Besides, ZENITH attaches great importance to auxiliary devices, too. Successively, ZENITH has pushed out screens – Y series, YKN series and S5X series, feeders – ZSW series, TSW series and BWZ series, as well as the sand washer – XSD series. Whether in chemical engineering, energy source, building material or metallurgy field, ZENITH always pursue high technology and high quality. It’s a ZENITH’s mode on business management. By innovating crushing and grinding technologies nonstop and with advanced administration and the ideal quality control system, ZENITH is committed to bringing you better products and services.